It is my first post on the forum. As a kid, I used to love the Dino Riders Lines. 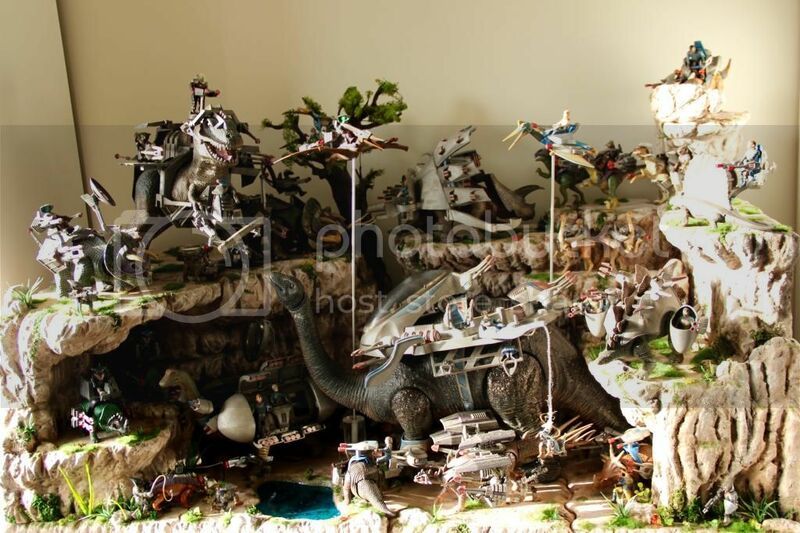 2 years ago, I was browsing the web, and discover this forum alongside the website dinoriders world. It reminded me how cool the toys were. But I was wondering how better it would have been if it was more detailed. So I decided this big project consisting of buying the entire collection on ebay, re paint them all using war hammer paint, build a huge diorama, and put them all in one big scene. I managed to finished everything 1 day after the birth of my baby girl. After that, I didn't have the time to start working on the diorama. I found this artist on the web really talented who did it for me. And the project finally got completed last month. This must have been so much work ! You should submit an alternate version to the diorama contest next year. A very nice project indeed! Lots of neat stuff to look at; great work! Thanks for letting all of us take a look. This is epic! Oh, the nostalgia!